Last night the season premiere of South Park’s 20th season aired. It’s hard to believe the hilarious animated comedy has been around for that freaking long! I can still remember being passed a VHS tape of South Park short animated cartoons in high school before Comedy Central had even picked up the series. My friends and I must have watched that tape a hundred times! To celebrate the start of South Park Season 20, Bottleneck Gallery has announced a new series of officially licensed screen prints based on the show by artist Florey. His new series will focus on some of the best and most memorable episodes of South Park to date. To launch this new South Park Screen Print Series, Florey has designed a poster based on Episode 116: Awesom-O. It’s a hilarious, vibrant, and cheeky print that’s perfect in every way. 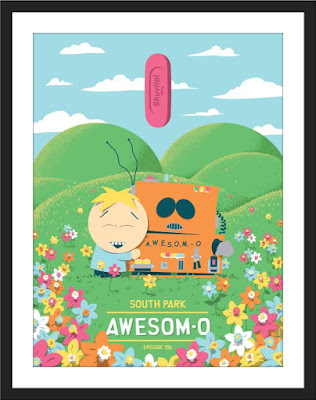 “Awesom-O” by Florey is an 18”x24” hand numbered 7 color screen print. Limited to 225 pieces, fans can purchase this poster now at the Bottleneck Gallery online store now for $40.